/ Home / Press office / Tooth Defenders to the rescue! Tooth Defenders to the rescue! 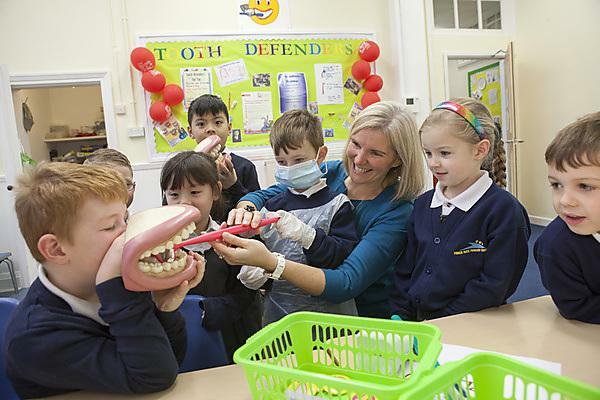 Schoolchildren at a primary school in Plymouth are improving their own oral health and that of their classmates, thanks to the innovative Tooth Defenders scheme introduced by the Peninsula Dental Social Enterprise (PDSE) at Plymouth University. Members of the Community Engagement Team at PDSE have been working with pupils and staff at Prince Rock Primary School to bring the Tooth Defenders scheme to the school’s Breakfast Club. The objective of the Tooth Defenders scheme is to establish a supervised tooth brushing club as part of the Breakfast Club, supported by members of the school’s staff trained as dental ambassadors and giving the pupils the opportunity to be recruited as a Tooth Defender. Over the course of a week the team have run a training workshop for staff dental ambassadors, where they have been taught how to brush children’s teeth safely and effectively and how to supervise the tooth brushing club. The Community Engagement Team have worked with the pupils to promote oral health and awareness, learn good brushing techniques, and make good diet and nutrition choices. They have also provided information about accessing local dental care. They have also recruited Tooth Defenders among the pupils themselves, whose role it will be to help their fellow pupils improve their oral health and adopt healthy lifestyle choices. Poor oral health can lead to all manner of problems for children. They may experience pain, disturbed sleep and disrupted eating patterns. Children with oral health problems are more likely to need emergency dental treatment and antibiotics, and be admitted to hospital to have teeth removed under general anaesthetic. As part of the Colgate Bright Smiles Bright Futures initiative the team plans to enter the project to receive an award which will be judged by a panel from the British Dental Association (BDA) and British Association for the Study of Community Dentistry (BASCD).